Advent (Joy): Of Giving | Words of Wisdom? For the past few years, we at UUCG have “adopted” students at a local elementary school and created an angel tree at Christmastime, sponsoring families that are challenged to provide their children with a bountiful Christmas. 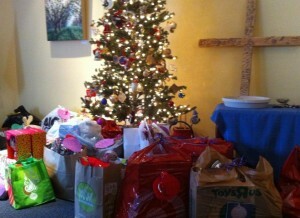 This week, this year’s gifts were gathered in the sanctuary to be sorted, transported, and distributed to these families. The sight of generosity-made-tangible was incredibly heartwarming, and literally brought tears to my eyes. I teach my four sons that Christmas is about giving. I have a very specific definition of who Santa is, and why he does what he does. From a very early age, my children have understood that the reason that Santa comes and brings presents is so that children all around the world will know the feeling of joy that comes with receiving a gift, and will be inspired, throughout their lives, to provide others with that feeling. In my home, we know that Santa is eternally “jolly” because of his generous heart, and because all year he lives into his singular purpose of giving to others. This theme of generosity, of service to others, is not present only in the secular celebration of this season, of course. The religious celebration of Christmas is about God having given his only son to the Earth. His son, who would eventually give himself for all people’s salvation. And because it doesn’t necessarily take money, everyone can experience the depth of the joy in giving. All it takes is open eyes, to see a need; and an open heart, to take action to fill it. And behold, the result is joy. Do you find this devotional thoughtful? If so, please consider using the buttons below and – via Facebook, Twitter, Google+, or other social media – sharing it with your friends. This entry was posted in Advent, Joy and tagged connection, gifts, joy, service. Bookmark the permalink. I’m so glad! Thank you, Lydia. I love the beautiful image of Santa that you conveyed to your children! I cannot imagine a more wonderful way to help them develop a giving spirit. Thank you for sharing your words of inspiration. All of you who are writing these daily posts are “giving” me and many others wonderful words of inspiration. Thank you so much, Peggy. Writing them is bringing us joy, and receiving comments and feedback is always a gift to us as well. As to Santa, I love the tradition, but from the beginning it has been important to me that the boys not see Christmas as “gimme, gimme, gimme”, but understand the true meaning behind it all: generosity and gratitude. To me, *that is the “reason for the season”.